QPR secured their first home win of the season as they defeated Barnsley. Akos Buzsaky scored twice with close range and 30-yard efforts to add to Mikele Leigertwood's 25-yard opener as Rangers raced into a three-goal lead. Barnsley's Stephen Foster nodded in and when Adam Hammill was fouled and Andy Gray netted after his penalty effort was initially saved, it was 3-2. But Ben Watson and Jay Simpson quashed any hopes of a Barnsley fightback with scrambled efforts for the Londoners. Leigertwood had given the home side the lead when he came forward from defence to shoot home from distance. The hosts doubled their advantage when Watson slipped Buzsaky in behind and the Hungary international tucked the ball past David Preece. Buzsaky add the third five minutes before half-time when he collected the ball from distance and curled his effort into the net. Barnsley pulled one back at the start of the second half when Foster rose highest to nod Iain Hume's cross past Radek Cerny. They reduced the deficit still further when Damion Stewart tripped Hammill in the area. Gray's spot-kick was saved by Cerny but the striker tucked the rebound in. But Rangers regained control and scored again when a Buzsaky cross was headed back across goal by Rowan Vine and Watson's effort was fumbled over the line by Preece. Rangers made the game safe when Kaspars Gorkss's header caused more mild panic in the Barnsley box and Simpson got the final touch to complete the scoring. "We've raised the bar. I was worried about today because I know Mark Robins is a very good manager and his side have improved under him, so it was always going to be a tricky game for us, especially after all the hype. "We had to do whatever we could to get three points and some of our play was extremely good. "It was a bit nervy at times and we afforded them a few too many chances, but all in all I am pleased." "It was a costly first 10 minutes and we shot ourselves in the foot. "We allowed them too much room and conceded some very poor goals. "We can point to the fact it was a new back four but they are decent players. "We came within a whisker of equalising but then pushed forward and forgot to defend again." 90:00+6:00 The referee ends the match. 90:00+5:33 Alessandro Pellicori decides to take a short corner. 90:00+5:12 Alejandro Faurlin takes a shot. Save by David Preece. 90:00+1:31 Jamal Campbell-Ryce fouled by Ben Watson, the ref awards a free kick. Jamal Campbell-Ryce takes the direct free kick. 88:59 Carl Dickinson takes a long range shot clearing the crossbar. 88:27 Free kick awarded for an unfair challenge on Stephen Foster by Alessandro Pellicori. Stephen Foster restarts play with the free kick. 87:55 Hugo Colace produces a right-footed shot from close in which goes wide of the right-hand upright. 86:28 Free kick crossed right-footed by Adam Hammill from left wing, Damion Stewart manages to make a clearance. 86:28 Booking Gary Borrowdale booked. 86:09 Gary Borrowdale challenges Anderson De Silva unfairly and gives away a free kick. 85:20 Adam Hammill fouled by Mikele Leigertwood, the ref awards a free kick. Adam Hammill crosses the ball from the free kick right-footed from left wing, Ben Watson makes a clearance. 83:57 Adel Taarabt takes a shot. Stephen Foster gets a block in. 82:01 Gary Borrowdale handles the ball and concedes a free kick. Free kick taken by Adam Hammill. 80:18 Jamal Campbell-Ryce takes a shot. Save by Radek Cerny. 79:32 Substitution Jay Simpson leaves the field to be replaced by Alessandro Pellicori. 78:44 GOAL - Jay Simpson:QPR 5 - 2 Barnsley Jay Simpson gets on the score sheet with a goal from inside the six-yard box to the bottom right corner of the goal. 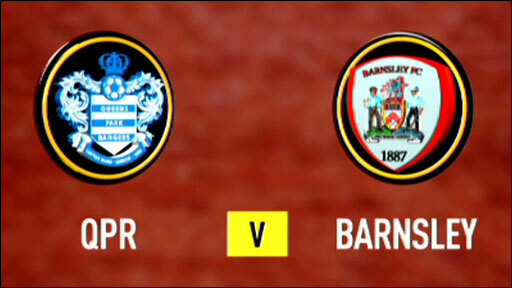 QPR 5-2 Barnsley. 77:02 Adel Taarabt takes a shot. Robert Kozluk gets a block in. Inswinging corner taken from the right by-line by Alejandro Faurlin. 76:25 Foul by Hugo Colace on Adel Taarabt, free kick awarded. Free kick taken by Ben Watson. 75:17 Substitution Andy Gray goes off and Jamal Campbell-Ryce comes on. 74:58 Adel Taarabt produces a right-footed shot from the edge of the area and misses to the left of the target. 72:47 The referee penalises Adam Hammill for handball. Indirect free kick taken by Damion Stewart. 69:57 Adel Taarabt takes a shot. David Preece makes a save. 68:22 Substitution (QPR) makes a substitution, with Adel Taarabt coming on for Rowan Vine. 68:22 Substitution Alejandro Faurlin joins the action as a substitute, replacing Wayne Routledge. 66:35 Rowan Vine provided the assist for the goal. 66:35 GOAL - Ben Watson:QPR 4 - 2 Barnsley Ben Watson finds the back of the net with a goal from inside the six-yard box to the bottom left corner of the goal. QPR 4-2 Barnsley. 65:23 Unfair challenge on Ben Watson by Nathan Doyle results in a free kick. Kaspars Gorkss restarts play with the free kick. 64:58 Shot from a long way out by Martin Rowlands goes wide of the left-hand post. 63:39 Adam Hammill takes a shot. Save made by Radek Cerny. Corner taken by Adam Hammill, Damion Stewart makes a clearance. 63:05 Shot by Akos Buzsaky from just outside the area goes over the net. 62:00 Free kick awarded for a foul by Andy Gray on Damion Stewart. Radek Cerny takes the direct free kick. 60:21 Effort from the edge of the penalty box by Jay Simpson goes wide of the right-hand upright. 59:39 Free kick taken by Gary Borrowdale. 59:39 Booking The referee cautions Robert Kozluk for unsporting behaviour. 58:40 Robert Kozluk concedes a free kick for a foul on Akos Buzsaky. 56:37 David Preece takes the free kick. 56:37 Substitution (Barnsley) makes a substitution, with Robert Kozluk coming on for Jacob Butterfield. 56:37 Martin Rowlands challenges Adam Hammill unfairly and gives away a free kick. 56:17 Inswinging corner taken by Akos Buzsaky, save made by David Preece. 55:31 GOAL - Andy Gray:QPR 3 - 2 Barnsley Andy Gray grabs a goal from close in to the bottom left corner of the goal. QPR 3-2 Barnsley. 53:55 Penalty taken by Andy Gray saved by Radek Cerny. QPR 3-1 Barnsley. 53:55 Adam Hammill fouled by Damion Stewart, the ref awards a Penalty. 51:58 Iain Hume takes a shot. Damion Stewart gets a block in. 50:03 The assist for the goal came from Iain Hume. 50:03 GOAL - Stephen Foster:QPR 3 - 1 Barnsley Stephen Foster grabs a headed goal from inside the six-yard box. QPR 3-1 Barnsley. 49:02 Jay Simpson has an effort at goal from deep inside the area missing to the left of the target. 47:47 Nathan Doyle challenges Akos Buzsaky unfairly and gives away a free kick. Free kick taken by Radek Cerny. 46:07 Unfair challenge on Nathan Doyle by Jay Simpson results in a free kick. Nathan Doyle takes the direct free kick. 45:00+2:37 The match has reached half-time. 45:00+0:49 Foul by Ben Watson on Hugo Colace, free kick awarded. Carl Dickinson takes the direct free kick. 43:24 Rowan Vine takes a long range shot harmlessly clearing the crossbar. 42:26 Foul by Mikele Leigertwood on Adam Hammill, free kick awarded. Carl Dickinson takes the direct free kick. 42:05 Rowan Vine takes a shot. David Preece makes a save. 40:02 Kaspars Gorkss restarts play with the free kick. 40:02 Booking Anderson De Silva is booked. 39:42 Unfair challenge on Kaspars Gorkss by Anderson De Silva results in a free kick. 38:45 Assist on the goal came from Jay Simpson. 38:45 GOAL - Akos Buzsaky:QPR 3 - 0 Barnsley Akos Buzsaky finds the back of the net with a goal from outside the area to the top right corner of the goal. QPR 3-0 Barnsley. 37:46 Corner taken by Iain Hume from the right by-line to the near post, Damion Stewart manages to make a clearance. 36:52 Free kick awarded for a foul by Damion Stewart on Andy Gray. Carl Dickinson takes the direct free kick. 35:54 Inswinging corner taken by Akos Buzsaky from the left by-line played to the near post, save by David Preece. 35:10 Mikele Leigertwood restarts play with the free kick. 35:10 Booking Ryan Shotton booked for unsporting behaviour. 34:55 Free kick awarded for a foul by Ryan Shotton on Mikele Leigertwood. 33:14 Ben Watson takes the outswinging corner, Anderson De Silva manages to make a clearance. Corner taken by Ben Watson, Stephen Foster makes a clearance. 32:16 Free kick awarded for a foul by Wayne Routledge on Carl Dickinson. Carl Dickinson restarts play with the free kick. 30:19 Adam Hammill has an effort at goal from outside the area missing to the wide right of the target. 27:29 Martin Rowlands produces a drilled right-footed shot from 20 yards. Ryan Shotton gets a block in. Corner taken by Ben Watson from the right by-line, Ryan Shotton makes a clearance. Effort on goal by Akos Buzsaky from outside the penalty box goes harmlessly over the bar. 26:51 The official flags Andy Gray offside. Damion Stewart takes the indirect free kick. 22:56 Corner taken right-footed by Iain Hume to the near post, Kaspars Gorkss makes a clearance. Shot from just outside the box by Jacob Butterfield misses to the right of the target. 22:01 Anderson De Silva takes a shot. Save by Radek Cerny. 20:14 Anderson De Silva challenges Gary Borrowdale unfairly and gives away a free kick. Ben Watson delivers the ball from the free kick right-footed from left channel, save by David Preece. 18:30 Hugo Colace takes the chance to get an effort at goal. Martin Rowlands gets a block in. Corner taken right-footed by Iain Hume from the left by-line to the near post, Ben Watson makes a clearance. 16:58 Wayne Routledge takes a shot. Save by David Preece. 14:11 Assist by Ben Watson. 14:11 GOAL - Akos Buzsaky:QPR 2 - 0 Barnsley Akos Buzsaky finds the net with a goal from close range to the bottom right corner of the goal. QPR 2-0 Barnsley. 12:14 Ben Watson is penalised for a handball. Free kick taken by David Preece. 8:33 Free kick awarded for a foul by Rowan Vine on Nathan Doyle. Free kick taken by David Preece. 6:49 Assist on the goal came from Wayne Routledge. 6:49 GOAL - Mikele Leigertwood:QPR 1 - 0 Barnsley Goal scored by Mikele Leigertwood from just outside the box to the bottom right corner of the goal. QPR 1-0 Barnsley. 5:28 Iain Hume has an effort from just inside the box that misses to the left of the target. 4:22 Gary Borrowdale challenges Anderson De Silva unfairly and gives away a free kick. Iain Hume delivers the ball from the free kick right-footed from right channel, clearance made by Ben Watson. 2:56 Corner taken by Iain Hume from the left by-line to the near post, Mikele Leigertwood manages to make a clearance. Close range shot by Anderson De Silva goes over the bar. 1:17 Akos Buzsaky takes a shot. Blocked by Ryan Shotton.